Rembrella is a small, family-run company set up in 1998 with the launch of The Poppy Umbrella. 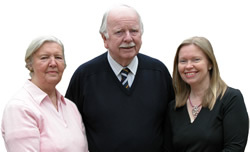 The family behind Rembrella is responsible for the design of The Poppy Umbrella and for its manufacture on our behalf by the internationally renowned umbrella company of A. Fulton Co. Ltd.
Rembrella Ltd. is managed by Joanna Legg, supported by her parents, now retired, Graham and Rona Parker. Rembrella Ltd. is the official sole distributor of The Poppy Umbrella. We choose to supply to gift shops trading in support of welfare charities, educational and heritage organizations. Such organizations include The Royal British Legion online 'Poppy Shop', the Royal Hospital Chelsea Museum shop and the National Memorial Arboretum gift shop. Proceeds from sales of Poppy Umbrellas by these and similar organizations help them to support their work. As an ex-military family, having served for a total of 45 years with the British Army, we are proud that our unique Poppy Umbrella has helped to support the good work of such organisations over the past twenty years. On completion of 32 years' service with the British Army Graham served a further 13 years on the British Army Liaison Staff in Belgium. 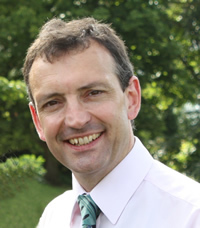 Following research into family members who served in the Great War of 1914-1918, and regular requests to organise visits to the 1914-1918 battlefields, Graham founded “Flanders Tours” in 1988. For 12 years the family organized weekend study tours to the Western Front. The photograph is of Graham's uncle, Corporal Thomas Henry Parker, who was killed in action on 6 November 1916 with the 2nd Battalion Royal Welsh Fusliers. Whilst living in Belgium in the 1980s and 1990s Graham was invited to serve on the Committee for Special Events in Ypres. Over the years he has been involved with numerous commemorative First World War events in Belgium and France. Graham's comprehensive knowledge of the subject and his deep respect for those involved in the First World War inspired many of the travellers with him to the battlefields to carry out research, write books and follow in the footsteps of their 1914-1918 ancestors. 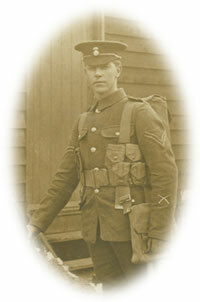 Graham is a Vice-President of The Western Front Association and an honorary member of the Guild of Battlefield Guides. Graham is a Rotarian and a Paul Harris Fellow. The idea for The Poppy Umbrella came to Graham on Armistice Day 11 November 1995 as he was leading The Poppy Parade past the famous Cloth Hall in Ypres-Ieper, Belgium. Rain began to fall and the street was soon lined with multi-coloured umbrellas. 1995 was the commemoration of the 80th anniversary of the Ypres battles of 1915, and it was also 80 years since the Canadian doctor and artilleryman Lt Col John McCrae had written the poem “In Flanders Fields”. 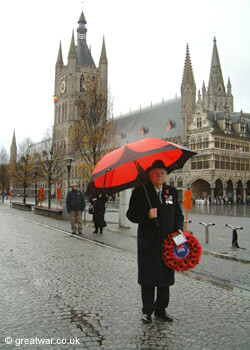 The sight of coloured umbrellas lining the streets of Ypres and the image of red poppies from McCrae's poem combined in that moment to give Graham inspiration for The Poppy Umbrella. Rona assists Joanna with Rembrella's administration. Rona's father was one of five brothers who served in the First World War, along with six of his cousins. Two of his brothers and three cousins were casualties and are buried in France. Joanna graduated with a BA Honours degree in German Studies from the University of Warwick in 1982. She was employed for three years in the Publicity Department at the Imperial War Museum in London. In the 1980s and 90s Joanna worked with a number of organisations as an administrator and organiser. She also administered the family's WW1 battlefield tour company “Flanders Tours” and assisted as a guide, telling the German side of the story. Joanna shares her father's passion for the study of the First World War and the Western Front. From 1995 she began research into the German Army to portray the battles from “the other side of the wire”. For several years she presented the German story at Western Front Association meetings and on the battlefields of the Somme, Ypres, Loos, Vimy and the Vosges. David is Joanna's husband. He has over 30 years' experience as a software engineer. David is responsible for the development of the websites at www.rembrella.co.uk and www.greatwar.co.uk. Visit our highly acclaimed WW1 website to see fascinating information about visiting the First World War battlefields on the Western Front in France and Belgium. We have run the website in our spare time for 20 years; it is a labour of love and very rewarding to help people discover more about the First World War. The website is illustrated with many photographs and gives locations and details about cemeteries, memorials, museums and commemorative sites. Our family has twenty ancestors who served in the Great War of 1914-18. The website offers helpful information for family historians wanting to find out about researching a relative who fought in the Great War of 1914-1918. Joanna spends many hours answering enquiries and helping people who are searching for sources of information. The website at www.rembrella.co.uk is managed by Rembrella Limited.